New Delhi: 25 years back a star in the field of education, came to inception– FIITJEE. FIITJEE has not only changed the face of IIT-JEE training industry but has also been setting exceptionally high standards of transparency & ethics, for other institutes to follow. While IITs & IIMs are struggling under the burdens of securing good faculty, FIITJEE has elucidated that with strategic training; excellent faculty can be evolved and harnessed to their fullest potential. 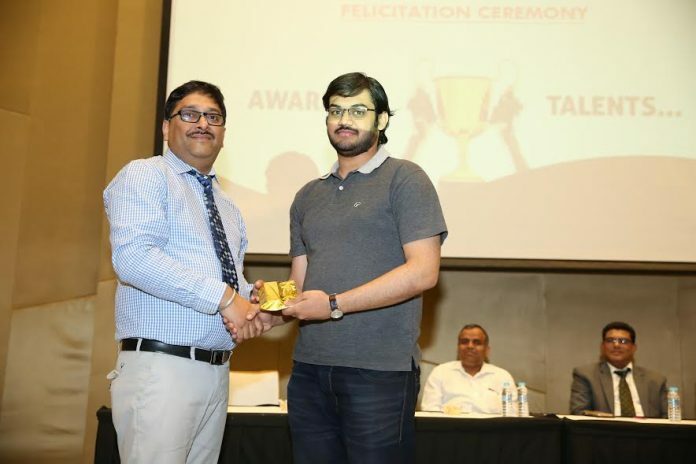 On this high note, FITJEE had initiated an all-India IIT Genius Test, which saw an eventful conclusion on 9th of April, at Vivanta by Taj, Dwarka. As FIITJEE is celebrating their 25-year completion in June 2017, it had decided to commemorate the geniuses of the nation through its revolutionaryIIT Genius Scholarships. The glittering event was held to felicitate students for their intelligence and analytical skills. The scintillating award ceremony was a befitting gesture of honouring these outstandingly exemplary students. These students were rewarded with Medals, Honour of IIT Genius Certificates. The IIT Geniuses also had a golden chance to interact with previous years’ toppers who successfully made it to premier institutes at the event; they shared insights to crack engineering exams and other competitive exams. The session witnessed aspiring students seek guidance from Kartikeya Gupta – AIR-4 , IIT-JEE topper for the year 2013 . He is presently studying in Computer Science, at IIT Delhi. They gave valuable insights to IIT Geniuses for obtaining the best results in JEE Main, JEE Advance and other competitive exams such as KVPY and various Olympiads (National & International). The Champions gave the aspiring students very useful tips, while also letting them know about the personality traits and values acquired from FIITJEE. On this momentous event,Mr. R. L. Trikha, Director, FIITJEE, said “We are delighted to announce the 10 recipients of each class for our innovative IIT Genius Scholarships. An India-wide assessment examination was held, post which a stringentwell-structured interview helped us zero-in on these remarkably intelligent students. These students signify the spirit to achieve; a quality that we have enshrined in the foundation of FITJEE, since our humble beginnings. Brilliance is never restricted to race or other prejudices, it only shines anywhere and FIITJEE knows how to identify a rare diamond in the heap. We, at FIITJEE, congratulate these students and wish them for a bright future ahead”.